On Friday, July 14, 2017, two movie-loving chimps from T.I.G.E.R.S. Myrtle Beach Safari attended the opening of the new movie "War for the Planet of the Apes" at Stone Theatres' Grand 14 at The Market Common in Myrtle Beach. 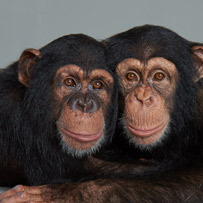 The three-year-old chimps known as Vali and Sugriva were accompanied by their caretakers from T.I.G.E.R.S. Myrtle Beach Safari in Myrtle Beach, South Carolina. Vali and Sugriva are young veteran movie-going chimps "regulars" that attend all "Planet of the Apes" movie premieres, just like their human counterparts. While both are usually surrounded with an entourage of adoring friends, these two are excited to show their independence by paying for their tickets, popcorn, and juice just before heading into the cinema. Throughout the movie, Vali and Sugriva remained both attentive and mesmerized, and celebrated various action scenes, alongside their human counterparts, with applause and cheers (or by throwing popcorn at the bad guys). At the end of the movie, both chimps gave the movie two thumbs up (as they have with all previous "Planet of the Apes" movies). Vali and Sugriva's primary caretaker and founder/director of T.I.G.E.R.S. Myrtle Beach Safari, Doc Antle, is widely recognized as one of the foremost animal trainers in the world, having worked with thousands of animals and traveled the globe promoting the education and conservation of some of our planet's rarest and most endangered species. T.I.G.E.R.S. Myrtle Beach Safari and the Rare Species Fund are fully devoted and committed to educating the community and protecting endangered species such big cats, non-native bears, and great apes. To learn more about T.I.G.E.R.S. and Myrtle Beach Safari, please visit MyrtleBeachSafari.com.